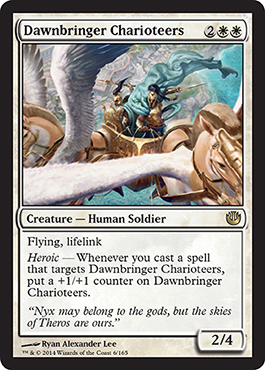 Welcome to Day 2 of Journey Into Nyx spoilers where we recap on the spoilers from the previous day that were not released at midnight and where we look at today's newest spoilers. Let's start with the old ones first. A 4 mana 2/4 with flying, lifelink, and Heroic which adds +1/+1 counters. 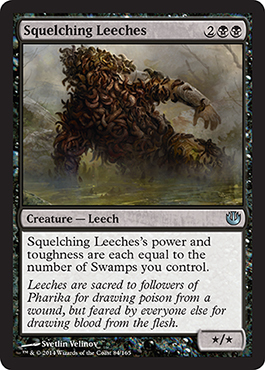 Looks great for limited and fairly decent for Standard. This will also be an intro pack foil and have an alternate art promo for prerelease. 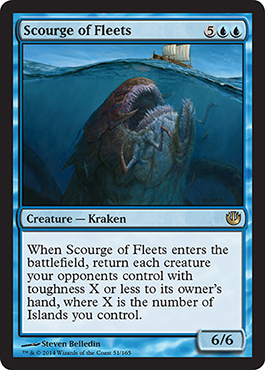 Blue removal in a 7 mana 6/6 Kraken. Not sold on it just yet, but will work in EDH for sure. This will also be an intro pack foil and have an alternate art promo for prerelease. 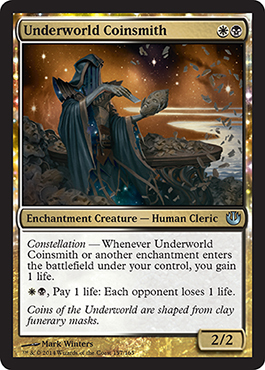 5 mana 4/6 with Constellation that gives opponents' creatures -1/-1 for the turn. Not bad, not bad... This will also be an intro pack foil and have an alternate art promo for prerelease. Mono-Black Devotion if I ever saw it. 4 mana for a creature with power and toughness equal to Swamps you control. Looking good! Enchantment with Flash (great for Constellations triggers on an opponent's turn) and it causes double damage dealt to permanents or players. Double-edged sword of course as this effect is global for all sources owned and controlled by all players. 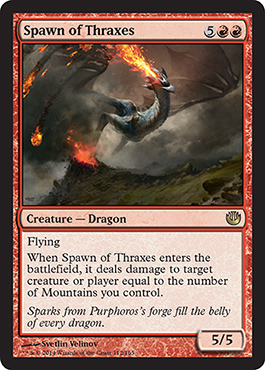 7 mana 5/5 dragon which deals damage equal to Mountains controlled. I'm noticing an underlying "land matters" sort of thing going on. Anyone else feeling this? This will also be an intro pack foil and have an alternate art promo for prerelease. 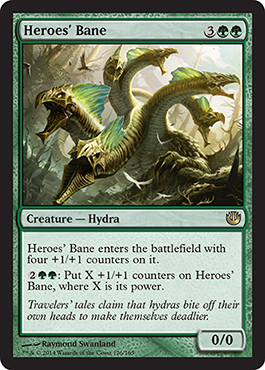 A 5 mana 4/4 hydra that doubles its counters every time you pay 4 mana. Mono Green Devotion could come back and be big. Think about it... Add haste, use Nykthos, add an absurd amount of mana, swing with something like a 32/32. Even on turn 6 it could be possible, maybe... This will also be an intro pack foil and have an alternate art promo for prerelease. Our first god! 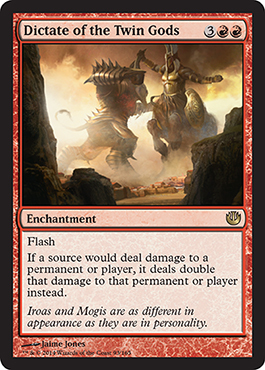 Indestructible, as always, a 7/4 for a converted mana cost of 4. Devotion requirement of 7 red and/or white combined. Creatures you control can only be blocked by two or more creatures and all damage dealt to your attacking creatures is prevented. Isn't that lovely? This will make R/W tokens a big thing maybe. Brimaz, Elspeth, etc. Our first new card for the day! 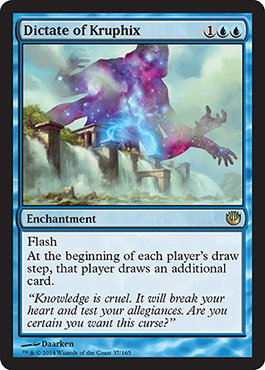 Another enchantment with Flash (thus triggering Constellation any time you feel like it), and everyone gets to draw extra cards. Play on an opponent's end step and you'll have the advantage. I like this one. 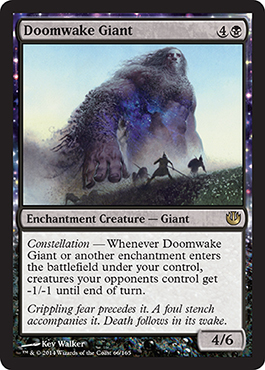 A 2 mana 2/2 which allows life gain any time an enchantment enters the battlefield under your control and then you can even pay 1 life and a white and black mana to cause opponents to lose one life. 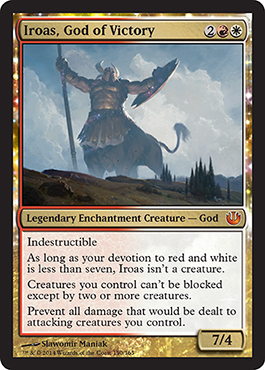 Looks like a great EDH or Two-Headed Giant card. That's all for this morning. Please check out our spoiler page for art, packaging, and all card spoiled so far.